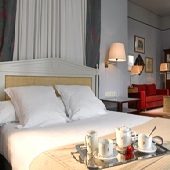 The Ronda Parador is situated in the former town hall, in the centre of the city. It is located in a very interesting spot next to the well known Puente Nuevo in Ronda. From the hotel windows guests may look down to the bottom of the 120 metres deep gorge. Inside colourful materials adorn the sofas and have been made into curtains. These bright and spacious living rooms have an abundance of plants while the bedrooms and comfortable split-level suites have beautiful views of the town or the swimming pool. 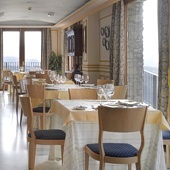 The menu in the Parador restaurant has local and international dishes. There is a special menu for those on a gluten free diet. The Parador group is well known for local cuisine. and this Parador has an excellent selection of dishes from Andalusia such as stewed partridge, roast kid, rabbit "a la rondena", almond soup, "ajo blanco" (cold garlic soup) and "salmorejo". The regional desserts to try are "Yemas rondenas" (sweet egg yolk flans), "tortitas de miel" (cake with honey) and "queso de almendras" (almonds and cheese). In Ronda, visit the New Bridge, the Cathedral, the Minaret of San Sebastian, the Mondragon Palace, and the bullring. Also the ruins of Acinipo and the prehistoric paintings of the Pileta cave. While in Ronda, attend the Royal Fair held from 20-22 of May; and the festival of Pedro Romero in the second week of September which include the traditional "corrida goyesca" (Goya-style bullfighting). Explore the Nieves and Grazalema Natural Parks either by foot or on horseback. You will want to swim in the pool at the Parador that gives incredible panoramic view.of the town, the gorge, the mountains and the hills. This Parador has sixty one bedded rooms, ten double bedded rooms and eight duplex rooms. Each has a telephone, television, safe, TV canal plus and a mini bar. The Parador of Ronda has heating, air conditioning, piped music, gift shop, a restaurant and bar, currency exchange, lift, paid garage, satellite television, free wireless internet, garden, seasonal swimming pool and conference facilities. Distance from the nearest airport is approximately 120 kms, train station is 1 km away and the nearest port is 125 kms away. First time in a Paradore and loved it. The reception staff were very helpful and kind. Food was lovely in the restaurant and at breakfast, very high quality. And then there were the views, spectacular, totally blown away. Loved it and will be back! Ronda is a great place to visit , and the Parador is in a perfect location for your visit . The hotel is beautiful , nearly all rooms have a great view but some ( superior ) have an awesome view !! . We were there for my 65th birthday and have no regrets with the choice of Ronda or the hotel , our room had just about the perfect view of the gorge with two balconies , just lovely. The breakfast was fine , no problems . The pool area was vey very nice as well with equally good views . However , this is my only gripe .... we were there for a week ( June 13-20 ) and at no point was there any service at the bar whilst round the pool ! ?, the door to the bar was even locked most of our stay , one bloke walked all the way through the hotel , through the restaurant to reach the public bar and then back with a drink ! crazy , and for a hotel of this standing it was very disappointing !. The bar itself that opened on to the walkway was also seldom available ?. However .. I would still highly recommend this Parador just as I would Ronda. G,Hodgson. England. We had a taster tour of Classical Spain in 2013. This gave us four hours in Ronda, which was not enough, though we managed a quick lunch in the Ronda Parador which convinced us that was the place to stay, so in March 2015 we returned for three nights. The room was large, clean and comfortable with a veranda in sight of the bandstand viewpoint and the hills beyond. With the veranda door open, revellers could be heard, but closing the door excluded the sound. 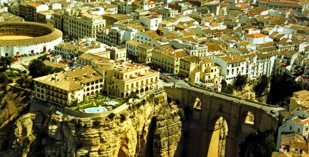 The public rooms of the Parador are worth a visit in their own right; the hotel itself is a few paces from the New Bridge, which takes you over the gorge to the many unmissable sights and buildings of the old town. The buffet breakfasts are ample with a varied menu. We loved our stay there and wish we had extended. The balcony view was breathtaking and the room lovely. Well worth the visit. Front desk very friendly. Perfect location. Highly recommend. Parador of Ronda is a luxury hotel in the old town hall on the edge of the gorge of Ronda.